Emmeline Pankhurst (née Goulden; 15 July 1858 – 14 June 1928) was an English political activist and leader of the British suffragette movement, which helped women win the right to vote. In 1999, Time named Pankhurst as one of the 100 Most Important People of the 20th Century, stating: "she shaped an idea of women for our time; she shook society into a new pattern from which there could be no going back". 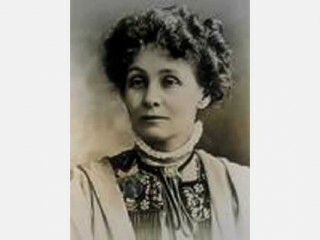 Known as the reformer, leader, and central player in bringing suffrage rights for women in England, Emmeline Pankhurst dared women to join the cause. Using historically controversial methods, she brought new public awareness to the many facets and issues dealing with women’s rights. As a young girl, Emmeline attended school in Paris. After completing her studies, she returned home and fell in love with Richard Pankhurst, an activist and radical for many causes in England. The two were said to be a perfect match for matrimony, and within months, the two were married. Tragically, Richard died some years later and left her with four children to raise. However, the death of her husband didn’t slow down Pankhurst’s momentum in fighting for the causes she believed in. She became a member of the Fabian Society, joined the Independent Labour Party, and worked as a registrar. She saw that there was a need for a radical reformation of women’s rights in the entire society. In 1903, she and one of her daughters formed the Women’s Social and Political Movement (WSPM). After gaining more members and articulating their cause even further, they demanded that the issue of women’s suffrage be brought up in the parliament. She and her team worked hard to harass members of parliament and thereby found a new outlet in which she could have her voice heard – the media. Later, Pankhurst discovered that an internal type of guerilla warfare caught more attention so she and the WSPM decided to make a statement and gain attention by burning buildings, defacing property, and interrupting the postal system. These acts, in turn, led to strikes, beatings, and a bill that would allow their freedom from prison. When the violence and public outcry for government intervention climaxed, the WSPM had a deal. The government would work to help them gain women’s suffrage, but World War I was beginning and the parliament had other concerns. Pankhurst then turned her attention to getting men to join the war effort so that women could work their jobs. This led to a nation-wide draft of all able-bodied men. While the group’s involvement in the “White-Feather Campaign” has never been completely proven, some proof exists that the group worked hard to get every man enlisted. As a result, women over thirty were given suffrage and some years later, all women over 21 were allowed to vote and hold seats in parliament. View the full website biography of Emmeline Goulden .